“We need to deal with the impacts of new energy projects at the level of the ecosystem, not just project to project," says wildlife veterinarian Dr. Joe Gaydos, lead author of a new paper analyzing the combined threats posed by six fossil fuel transportation projects in the Salish Sea. The new study by SeaDoc and the Swinomish Tribe was recently published in the international journal PLoS ONE. What did they find? Canada and the US need to do a better job collaborating on Salish Sea issues. The study evaluated the threats posed by each project to 50 species that are important to the Coast Salish people. These include endangered humpback and killer whales, and key food species including seaducks, salmon, clams, and Dungeness crabs. Although the Salish Sea is an integrated ecosystem, it is shared by Washington, British Columbia, and indigenous Coast Salish governments. When US and Canadian governmental bodies evaluate proposed developments, they rarely take into account projects occurring outside of their jurisdictions. This study makes it clear that managers need to establish a mechanism for addressing transboundary threats. Transboundary ecosystems like the Salish Sea, which exist around the world, are vulnerable to cumulative pressures when there is no mechanism for collaborative decision-making. Six years ago the Salish Sea was named. It is now time for the governing bodies responsible for the Salish Sea to create an effective system for evaluating threats across the entire ecosystem. Read the full study at PLoS ONE. For more background, see an article by Lynda Mapes at the Seattle Times, Northwest tribes unite against giant coal, oil projects. Banner photo: bulk carrier and killer whales share the Strait of Juan de Fuca southeast of Victoria, British Columbia. Photo courtesy of Jim Maya, Maya’s Images. Harbor porpoise by Florian Graner. Licensed through NaturePL.com. Noren, S. R., D. P. Noren, and J. K. Gaydos. 2014. Living in the fast lane: rapid development of the locomotor muscle in immature harbor porpoises (Phocoena phocoena). Journal of Comparative Physiology B. December 2014, Volume 184, Issue 8, pp 1065-1076. This study -- based on harbor porpoise tissue samples collected from strandings, fishery bycatch, or observed killings by killer whales -- looked at muscle development in juvenile harbor porpoises to understand how fast they mature into physically competent adults. This is important because it shows that immature harbor porpoises can't dive as well as adults and consequently have limitations on the kinds of habitat they can use. It brings attention to the concept that what might be okay for adult harbor porpoise (such as a certain level of boat traffic), might not be something that harbor porpoise calves can deal with as well as adults can. Humans aren’t born ready to hunt down game animals — or even order Chinese food. We need mothers to protect and feed us at least until we can read a take-out menu. Life is somewhat similar for baby dolphins and porpoises.Diving ability in marine mammals depends on specialized biochemistry. High concentrations of myoglobin provide oxygen to muscles so divers can remain active while holding their breath. They’re also able to buffer the flush of lactic acid from anaerobic activity after the oxygen is depleted. It takes time, though, for newborn cetaceans to develop these special abilities. A recent study by SeaDoc and Drs. S. Noren from UC Santa Cruz and D. Noren from National Marine Fisheries Service Northwest Fisheries Science Center (Seattle) used samples collected by the San Juan County Marine Mammal Stranding Network to measure diving capabilities in harbor porpoise, the Salish Sea’s smallest and most bashful cetacean. The results show that harbor porpoise achieve adult myoglobin levels by 9-10 months of age, and increased acid buffering as 2-3 year olds. This is faster than other cetaceans, which tracks with their earlier maturity and shorter lifespan. However, the study also proves that there is a period of time when harbor porpoise calves cannot keep up with the adults. This probably limits the habitat range and foraging of mothers and calves, leaving them vulnerable to habitat degradation. SeaDoc and collaborators have recently undertaken a study to pinpoint harbor porpoise calving times so that we can further protect them at this delicate stage. This is one of the first studies to document muscle biochemistry development in dolphins and whales. It’s been done before with Fraser’s and bottlenose dolphins, but not with species resident in the Salish Sea. Specimens for this research were collected opportunistically from stranded harbor porpoises, from animals caught accidentally by commercial fishing operations, and from animals killed by killer whales. Collection was performed through the San Juan County Marine Mammal Stranding Network. This program is administered through the Whale Museum and NOAA and is composed of a huge number of very dedicated volunteers. Based on length, specimens were divided into 5 age classes, from fetus to adult. Harbor porpoise workshop: On February 7, 2013, the Pacific Biodiversity Institute, Cascadia Research Collective and the SeaDoc Society hosted scientists from Washington and British Columbia to determine the state of knowledge on harbor porpoises and coordinate ongoing research efforts. Read the statement identifying research needs. Basking shark copyright Florian Graner. Used with permission. How do you know if your ecosystem is in trouble? One clue is the number of species that are in decline or endangered. If that number gets bigger over time, you’re probably heading in the wrong direction. We publish our Species of Concern analysis approximately every two years in conjunction with the biennial Salish Sea Ecosystem Conference. In any particular year species might be added or removed from the list. For example, in 2008, 3 species were added, 2 were removed, and the listing status for 12 previously included species was changed by one or more jurisdiction. Each jurisdiction in the Salish Sea (Canada, the United States, British Columbia, and Washington State) keeps their own list of species in trouble, but until 2002 nobody kept track of the total number of threated and endangered species in the whole ecosystem. Back then, SeaDoc scientists found a total of 60 species of Salish Sea invertebrates, fish, reptiles, birds, and mammals that we needed to worry about. Thanks to your support we’ve been able to repeat the analysis every two years. Unfortunately, the list keeps growing. Our latest accounting showed that the total number of species at risk has now nearly doubled, to 119. Recently listed species include the Basking shark, North Pacific spiny dogfish, Pacific Ocean perch, and Baird’s beaked whale. The fact that the list has almost doubled is a bad sign, and it suggests that our entire ecosystem is at risk. Your support enables us to take on these long-term, ecosystem-level initiatives that allow us to diagnose, and eventually reverse, problems like transboundary species declines. Thanks to your investments we’re able to publish scientifically rigorous metrics that help citizens and policy makers understand the big picture. The high proportion of species of concern is suggestive of ecosystem decay (Bierregard et al., 2001) and we suggest that it is time to consider the entire Salish Sea an ecosystem of concern. Increased funding and improved efforts to recover declining populations of species and recover this ecosystem are urgently needed to stop the insidious loss of species and ecosystem decay. At the 2014 conference, the 2013 paper was presented by co-author Jacq Zier, who won first prize in the undergraduate division for an oral presentation. 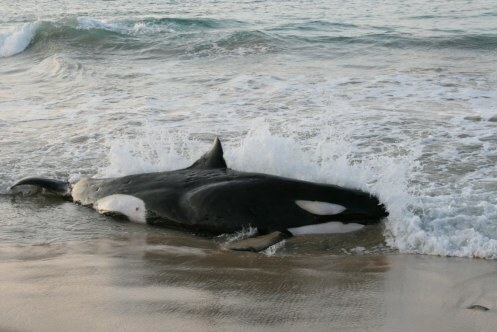 Killer whale strandings are rare events and biologists and veterinarians should use every stranding as an opportunity to learn more about this species. This necropsy and disease testing protocol, first published in 2005 and updated in 2014, will provide guidelines for more comprehensive necropsies and standardize disease screening so that we might learn more about diseases of free-ranging killer whales. SeaDoc recently spent 2 days at a sea star wasting disease summit hosted by the Seattle Aquarium. Scientists from all over the US and Canada who are studying this disease came to share their research and learn from each other. We still have a lot to learn about this disease, but data presented support: (1) this is an unsual mortality event, (2) the disease hits a wide range of sea star species, and (3) it affects different species of sea stars differently. Species that seem have been hit hard both in the wild and in captivity include the mottled star (Evasterias troschelii; pictured here), sunflower star (Pycnopodia heliantoides), spiny pink star (Pisaster brevispinus) and the ochre sea star (Pisaster ochraceus). Joe Gaydos notes, "I'm impressed with and inspired by all of the great scientific minds working to unravel this mystery!" SeaDoc was among dozens of collaborators that recently published a paper linking a virus to sea star wasting disease. The paper showed that a virus was involved in the massive outbreak that, since June 2013, has killed millions of sea stars (including more than 20 different species) along the west coast of North America.Interestingly, the same virus was found in museum specimens of sea stars collected 72 years ago, suggesting that a mutation in the virus (as has been seen with closely related viruses) could have triggered the outbreak. Work is continuing to better understand the other factors involved in this outbreak and how this massive loss of predators will reshape the marine ecosystem. Understanding emerging threats to the health of our oceans is a key part of SeaDoc's work, and donations to SeaDoc make it possible. Smithsonian Magazine also has a good article about the study and what it means. The San Juans were largely skipped by the wasting disease outbreak last fall, but this summer they were hit hard. Drew Harvell's lab at Friday Harbor Laboratories did investigations all summer long, and were able to watch as the disease swept across the archipelago. For example, the Eastsound waterfront area experienced approximately 95% wasting disease prevalence. Water temperature appears to play a large role in the disease. Researchers have also worked to identify genetic factors that appear to make it possible for some sea stars to survive the disease.Collaborators Morgan Eisenlord and Drew Harvell recently published a summary of their summer's work on sea star wasting disease in the San Juan Islands in the the Friday Harbor Labs Tide Bites newsletter. http://depts.washington.edu/fhl/tidebites/Vol14/index.html. Scientists are closer to having an answer to what's causing the mortality outbreak in sea stars. Drew Harvell of Cornell University and Friday Harbor Labs is working with a team that has traced the cause. Read the latest article from KUOW's EarthFix team about the current status of the outbreak. There's also a terrific video on that page featuring Drew Harvell. In October we looked for healthy and diseased sea stars during our dives for our new subtidal survey project. (See what else we found on those dives here.) During early November, we returned to two of the REEF monitoring sites from October where we saw the highest density of sea stars to see if sea star wasting disease has shown up since were were there last month. Fortunately we saw numerous sea stars and numerous species of sea stars and they all looked healthy. We will continue dives this weekend to look for more signs of disease. Seastar expert Neil McDaniel, (www.seastarsofthepacificnorthwest.info) has graciously shared his photos showing the progression of the disease over a short period of a few weeks. This can give you an idea of what you're looking for. The before-and-after photos are pretty shocking. View the photos at Janna Nichols' SCUBA photo page. If you're a diver or a beach-walker and you see sea stars (healthy or diseased), report them at the Vancouver Aquarium's Sea Star Wasting Syndrome web page. That page at the Vancouver Aquarium's website also has an overview of the outbreak. Seattle Aquarium veterinarian Lesanna Lahner was interviewed on Science Friday on NPR on December 5, 2014. The Northwest Indian Fisheries Commission posted a blog entry about how the Puyallup Tribe is tracking sea star wastage in the South Sound. Scientist Drew Harvell and diver Laura James wrote a blog post for the Nature Conservancy about the outbreak. In it, Harvell, who is one of the scientists doing genetic research on possible disease vectors, makes the case for better funding of scientific investigations of disease in the ocean.